Half a kilometer long (precisely 502 meters), over 74 meters high and 204 meters wide. Yes, these are real dimensions of a human-built machine which is (was) able to move and was used for moving extracted soil from mines. People call it "horizontal Eiffel Tower", even if her dimensions are quite ridiculous compared to this giant. And where can you see it on your own eyes? In Lichterfeld, around 60 km north from Dresden, in region which used to be an industrial center of Eastern Germany. The landscape here suffered by large surface brown coal mines but fortunately nowadays most of them are closed and being revitalised. Even this huge metal construction was planned to be dismantled but group of technical enthusiasts managed to preserve it as a tourist attraction and reminder of a history of this region. The active mining life of this particular F60 was quite short. VEB TAKRAF Lauchhammer company built this giant in the years 1989 - 1991 and it was working only 1 year (till June 1992). From 2002 it lives it's "second life" as a tourist spot and place for arranging cultural events. You can take a guided tour across the whole bridge up to the highest point in 74 meters. And the view from there is really amazing, I must recommend it. For those who want to visit this place, check the official webpage and just go there, it's worth it! F60 3D movie also introduces my new 2nd generation of 3D camera in action. You can enjoy sharper image, nicer colors...but the most important - 60 frames per second! 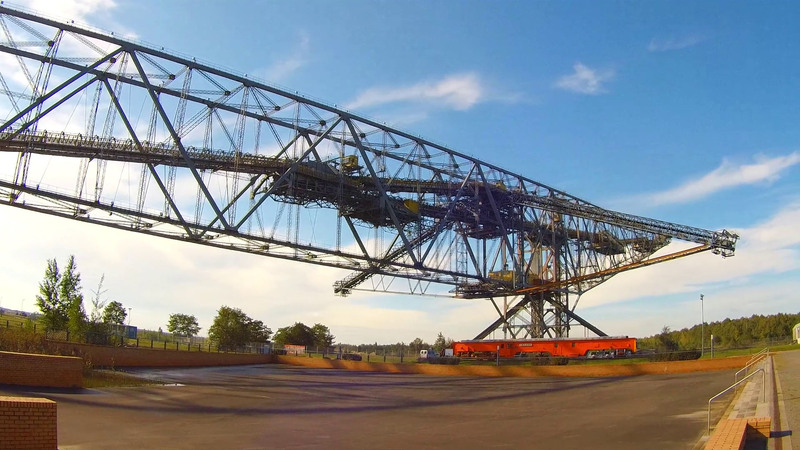 Ultimate 3D walkthrough documentary movie from former overburden conveyor bridge in Lichterfeld, Germany. Over 18 minutes of real 3D footage is ready to be played on any 3D television or virtual reality (VR) mobile headset. Free download & YouTube links are in the end of this article.